One faithful freezer, all stashed ready for the zombie apocalypse. How do I love my freezer? Let me count the ways. It may seem odd to pen an ode to my faithful freezer (and don’t worry, I’m not about to burst out into blank verse) but I reckon it really does save some serious cash. So when Mirror Online asked me to write an article about freezers, I was more than happy to oblige. Admittedly, I can’t claim credit for the headline: “The single magic item that slashes shopping bills, keeps me healthy and delivers food on demand”. But hey, it made me keen to find out what on earth was in the article, and I’d written it. 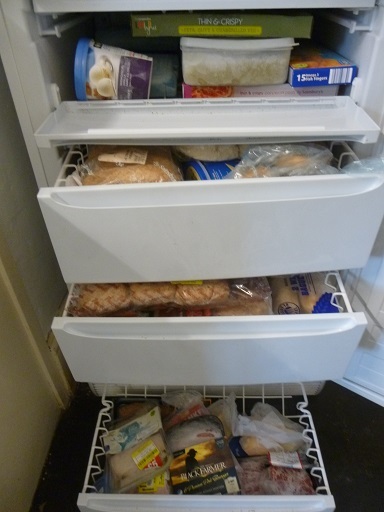 Anyone else think freezers rock when it comes to cutting food costs? I’d love to hear your top tips on making the most of your freezer. Oh good glad you enjoyed it. I still have memories of a little fridge with tiny icebox in student days so glad to have a bigger one now! Very good advice to all moneysavers young and old. I would like to add that bulk cooking and freezing also avoids me getting bored with cooking the same meals. I cook spag bol/chilli once about every 8 weeks (both at the same time and some of the spag bol turns into chilli) and I'm about to do 4 pasta bakes for 2, so I won't be making that for ages either. With things like bagels, toasting buns and muffins, I slice them before freezing so I can toast them from frozen. Thank you! And great advice about splitting bagels, muffins etc so they will toast straight from the freezer. I must try that. Yep, without our freezers we would spend a LOT more money. There's nothing better than being able to take advantage of supermarket 'yellow-stickered' packs of meat, fish or bread and then coming home, portioning into individual meal sizes and re-wrapping ready for popping into the freezer. I have never thrown bread away since I started freezing all sliced loaves for instance. If you slightly separate the slices before putting the loaf into the freezer it means you can take out just the right number of slices for toast each time you need it and pop them straight into the toaster. I do the same as Attila with bagels and slice them before freezing meaning that I can take out just as many half bagels as I need to toast from frozen. I also batch make scones and freeze them uncooked. When you fancy a scone or when visitors come unexpectedly you can cook them straight from frozen and make the house smell wonderful with home baking and have something lovely and fresh to serve with coffee.